ATOS Medical's commitment and dedicated specialization in the head and neck cancer field has allowed them to gain a deep understanding of the needs of customers. This understanding drives their innovation process. The TheraBite® Jaw Motion Rehabilitation System™ is a patient directed device which utilizes repetitive passive motion and stretching to restore mobility and flexibility of the jaw musculature, associated joints and connective tissues, and to reduce orofacial pain and inflammation. Prevent and treat trismus with the OraStretch Press Jaw Motion Rehab System. CranioRehab provides insurance pre-authorization, billing, and non-coverage discounts. We also carry products for xerostomia, microstomia, and liquid diets. Visit CranioRehab's table at the course to learn more about preventing and treating trismus. CranioRehab will be providing each attendee a demo bag with our OraStretch trismus and NutriSqueeze comfort items. 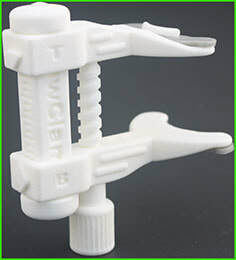 The JawClamp is a jaw rehabilitation device for people suffering from trismus. Inspired by people suffering from limited mouth opening after oral cancer treatment, the JawClamp is a hand-operated, light-weight, portable, and easy-to-learn passive jaw stretching device. The JawClamp comes in three different models according to the patient's needs. No prescription is necessary to purchase the FDA-approved JawClamp. As a supporter of the ARK-J Program, the JawClamp will be giving away a JawClamp model to 10 lucky course participants this October and offers a 20% discount on any JawClamp model for patients of ARK-J Program- trained SLPs.